ROBOT WARFARE is a A multiplayer online FPS robot shooter with dynamic robot wars. This blog will guide you how to play Robot Warfare on PC with MEmu App Player. Build your coalition of mechs, take part of global tournaments with a ranking scoreboard! Be the best of the best in the team and the death-match battles. Prove your fighting skills in real robotic PVP battles in multiplayer robot games mode! 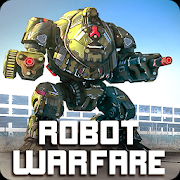 I recommend playing Robot Warfare on PC using MEmu Player. If you haven’t downloaded already, please install it here. Once installed, you will see it on your home screen list of apps. Just simply open it and the first launch will begin to download game resources. Once it completed, you will able to play Robot Warfare on your computer!